der that I never would have discovered this most exquisite indulgence had it not been for the Masterpiece series. Having watched all the episodes of Season One at least twice, it was absolutely necessary that I grab the first two audiobooks to appreciate the entire story. 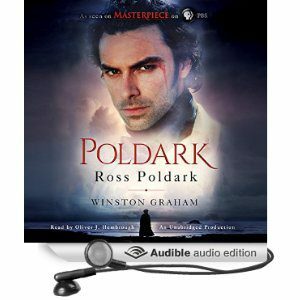 Oliver Hembrough narrated Ross Poldark, the first audiobook, and I must say his performance is extraordinary. Still, I was even more delighted to listen to Demelza, the second audiobook in the series, narrated by Clare Corbett. It’s another 5-star performance in my estimation. 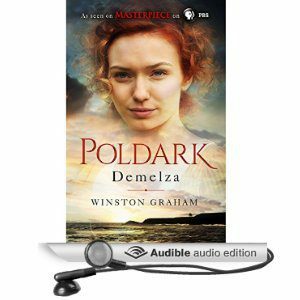 If you enjoyed Masterpiece’s first season and you find yourself longing for more Ross and Demelza while waiting for the second season, listen to these audiobooks. You will love them! 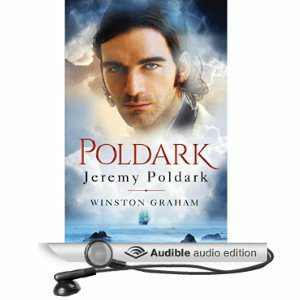 As I write this post, I’m listening to the third audiobook in the series: Jeremy Poldark. I truly meant to wait until the start of Season Two before continuing with the audiobook series, such was my great pleasure in watching each episode as it aired on PBS on Sunday nights. Steady to my purpose, I resisted for all of a week. I simply could wait no longer to discover what was next for Ross and Demelza. The Masterpiece series is best described as an adaptation of Winston Graham’s story, what with all the liberties it takes with the storyline, but there are not so many as to take away from my enjoyment. Thanks to the series, my pleasure is enhanced with visions of Aidan Turner as Ross and Eleanor Tomlinson as Demelza. In addition to the PBS episodes, I watched Season One on Blu-ray. What a treat that afforded with the occasional bonus snippet here and there—be it a look, a word, or an entire scene. It’s well worth the time to check it out. For those details that neither the Masterpiece adaptation nor the book provided, for example what happened when Ross and Demelza gave into their passion—well, my eager imagination has filled in the blanks with a little morsel I titled He Lit Another Candle. Written entirely for my own reading pleasure, the characters are nameless. I am afraid that sharing He Lit Another Candle is out of the question—not because it’s inspired by Poldark, but because it’s strictly a behind closed doors imagining. Here’s something I can share, however. It’s a snippet from my current work in progress, As Good as a Lord. “As we both are of a mind of being in the other’s debt, what say you we consider ourselves even?” Darcy took Elizabeth by the hand. “All mistakes of the past shall be forgotten and only our present and future deeds shall be the basis for a new understanding between us.” He raised her hand to his lips and gently kissed her knuckles. The brush of his lips against her skin sent scintillating waves throughout her body. She tore her eyes from his hand gently caressing hers and met his—dark and passionate with a mixture of brooding laced with longing … imploring. “Do we have an agreement?” Darcy asked, his voice tender. The last time they had been standing this close and looking at each other this way she’d felt something akin to wonderment amid her furiousness over his ill-timed, ill-worded avowal of his ardent admiration for her. He had been that close to kissing her—every fiber of her being had informed her as much. Her lips slightly parted, her eyes broke away from his and fell to his lips—moist and intoxicatingly inviting. Closing her mouth and biting her lower lip, she ran her tongue along its edge just so, in preparation for what might very well be her first kiss ever and not just by any man, but this man. This man who occupied her thoughts more than she dared to confess to anyone—even herself. This man who now stood closer to her than he’d ever stood before. Another glance into his eyes reminded her that she had not yet replied. “Yes,” she said. “Yes,” she said again as though answering a yet unasked question. What say you to a giveaway in celebration of the upcoming release of As Good as a Lord? Comment for a chance to win a release day Kindle edition of the story. One winner will be chosen on Tuesday, September 1st. ← Where is my fairy godmother? Steamy Darcy & Elizabeth?? I am hooked on Poldark and rewatch the seasons for anything I might have missed the first time. I haven’t watched the new “Poldark.” They make him look a bit greasy, I think. The heroine in the original “Poldark” series was excellent, I think! I’ve also become hooked on the new Poldark series Pam! I love Aiden and Eleanor’s portrayal of Ross and Demelza. They have such great chemistry. I’ve watched season 1 over a few times and got really impatient. Tried reading the first book but got distracted by the earlier adaptation starring Robin Ellis. That fullfilled my Poldark cravings until this new season is released. Potentially there is so much story left I hope they continue this amazing series until the end! Thanks for your wonderful excerpt! It’s my pleasure, Vee. I’m counting the days until the start of Season 2. I’m also looking forward to receiving the next three audiobooks in the series on September 20th. Happy Days! Traveling. Found this post a little late. Yeah, another Pride and Prejudice Variation from one of my favorite authors. Cannot wait! Thanks so much for your kind words, Carol. I hope you’ll love the story! Yay for another P&P story! I don’t think they can ever be enough of them! Thanks, Sharon. I’m glad you enjoyed the excerpt.